Astronomers have found a quiescent black hole orbiting a massive, fast-rotating star, suggesting that these strange binary systems may be common throughout the Milky Way galaxy. 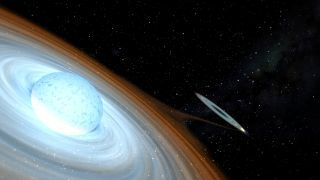 The huge star MWC 656, known as a "B-emission" or "Be" star, shares space with a companion stellar-mass black hole, researchers report in a study published today (Jan. 15) in the journal Nature. Surprisingly, the black hole emits no X-ray radiation, explaining how the object had eluded detection until now. Many Be stars like MWC 656 are known to have companions — most often, small and incredibly dense supernova remnants known as neutron stars. But a black hole had never been found with a Be star until now, researchers said. MWC 656 lies about 8,500 light-years away from Earth and is 10 to 16 times more massive than Earth's sun. The star spins so fast, at an estimated 671,000 mph (1.08 million km/h), that huge amounts of material are ejected from its equator, creating a disk around the star. Using two optical telescopes at the Roque de los Muchachos Observatory in the Canary Islands, Casares and his team studied emissions from this circumstellar disk. The scientists also detected optical emissions that they determined come from the "accretion disk" of gas and dust being sucked in by a nearby black hole. Analysis of these emission lines suggests that the black hole is 3.8 to 6.9 times more massive than Earth's sun, researchers said. It is thus a stellar-mass black hole, a type of object produced when gigantic stars run out of fuel and collapse in on themselves. Black holes typically emit high-energy X-ray light, which is generated when the material in the black holes' accretion disks spirals down into the hungry objects' maws. But this isn't happening in the MWC 656 system, likely because the companion star's disk (which contributes to the black hole's accretion disk) is spinning so fast. "The absence of X-ray emission from this system is evidence that material is not channelled into the black hole. Rather, it must be retained in a holding pattern within the accretion disk," Virginia McSwain, of Lehigh University in Pennsylvania, wrote in an accompanying commentary article in the same issue of Nature. "Gas in the outer regions of the Be star's disk will have high angular momentum, which will be transferred to the accretion disk during the mass transfer," McSwain added. "Without an efficient mechanism to remove this angular momentum, accretion will be sup­pressed and the black hole will remain quiet." The MWC 656 system could be just the tip of the iceberg, as many more such quiescent, stellar-mass black holes may populate the universe, McSwain wrote. Astronomers may soon spot other such systems, now that they know what to look for, she added. The new study may also force astronomers to rethink some of their ideas about the formation and evolution of black-hole systems, Casares said. "Population synthesis models predict very few black holes survive binary evolution producing Be/black-hole binaries such as MWC 656," he said, "the reason being that either the two stars merge before the black hole is formed or the binary gets disrupted by the supernova explosion. The fact this system is bright and relatively close indicates these binaries are more common than theory predicts, and this has strong implications for models of black hole formation and close binary evolution."